When most businesses create a new product or service offering they initially develop the attributes of the product or service. Makes sense, you don’t have anything to sell unless you create something people want to buy. But, the very next thing they do, once they think they have a winner of their hands, is go to work on the promotion of the new offering – the sales letter, landing page, brochure. Again, another important marketing consideration, but I would like to suggest what is ultimately a much stronger path to take. In other words, the very first thing you should do when thinking about bringing a product or service to market is to think about what you want the customer to be thinking and feeling about your product or service180 days or so after they made the purchase and work backwards toward the point where they become interested in making a purchase. The processes, touches and follow-ups you build by taking this “customer experience” approach can help ensure that you have a winner, promote a winner, and perhaps more importantly thrill your customer. In the rush to create and promote our goods it’s this final, crucial point that often goes without thought or is made up after repeat sales and referrals lag. Think of it this way – the sale is not complete until the customer is so happy they confidently make referrals. 180 days after purchase – customer receives free course updates and offer to meet with a select group of other course participants in an invitation only peer-to-peer group accountability program. Immediately on purchase – on successful shopping cart transaction customer is directed to Web page that hosts a welcome video that sets the expectation for when and how they will receive their purchase. Automated email provides instructions and orients the customer to the contents of their new purchase and how to receive support if they have questions. Trial – After viewing video series prospect is offered the opportunity to download 2 free chapters from the course and receive free 30 minute coaching session to discuss their specific challenges. 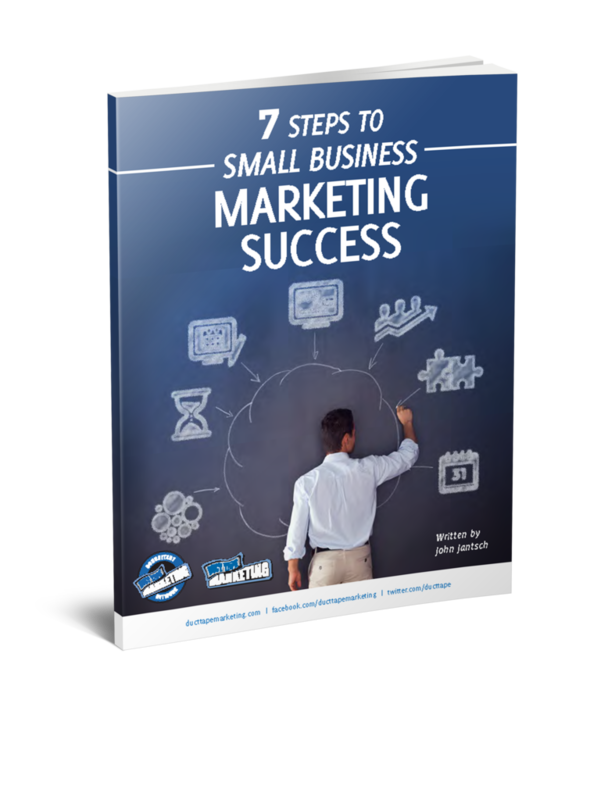 Obviously, the components of this approach will vary greatly depending upon the offering and prospective customer, but it’s the thinking here that’s so important. The process of beginning with the end in mind actually forces improvement on the product or service, creates opportunities to upsell and cross sell and focuses on the long term positive experience for the customer – which creates lead generation by way of referral and word of mouth. 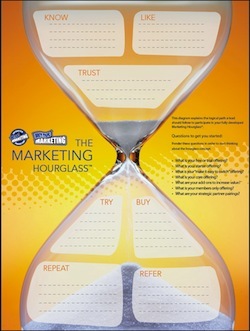 Astute Duct Tape Marketing readers might recognize this as The Marketing Hourglass – a process that suggests the development of logical processes that move prospects to customer and customers to loyal fans by way of 7 phases – know, like, trust, try, buy, repeat and refer. One final word of advice. Don’t make this a stiff, automated, spammy drip system. Put personality, fun, surprise and value in each and every contact.